Our Yoast SEO plugin handles optimization of your WordPress site for search engines and we dare say it does that pretty well. Most of that is technical optimization, like our XML sitemap functionality, as well as aids in content optimization, like your content and readability analysis. But there’s more to SEO than that. You need links pointing to your website and for that to happen, people need to talk about you and your website. That is the essence of social media, so our plugin helps you optimize for that as well! In our SEO plugin you’ll find a Social menu. In this post we’ll explain what it does and what you should do when you’ve installed the plugin. We’ll focus on Facebook and Twitter, as these are the biggest networks out there. Of course, there’s a note about Pinterest too. What’s the canonical URL of the page? What’s the name of the site and the title of the page? Which image / images should be shown when this post or page is shared on Facebook? Most of the values above are filled out by the plugin by default based on your post’s data. It uses the locale of your site, the site’s name, your SEO title, the canonical, the meta description value etc to fill out most of the required OpenGraph tags. First of all, go to SEO → Social, the Facebook tab and make sure OpenGraph is enabled. Then decide to use either a person or an application as the “admin” of your site, as this will allow you to use Facebook Insights. Just click the appropriate button and follow the on-screen guidance which will take you to facebook.com. Next, make sure you’ve entered the Facebook Page URL for your site or brand on the Accounts tab, as that will be connected to each post as the publisher. The settings below that are for the Frontpage: which image should it use and what description should be used. Take some time and craft these, making sure the image is large enough (at least 200px x 200px). Then, set a good default image. This will be used when you have a post or page that does not contain an image, so it can still be shared with maximal visibility. This image should also be at least 200px x 200px. Lastly, go to your personal WordPress profile (just click on your name, top right in the settings) and add a link to your Facebook profile, if you want to associate your Facebook profile with your content. If you do, be sure to also enable the “Follow” functionality on Facebook. As you can see, this is a few minutes work. 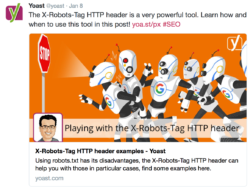 After that, Yoast SEO takes all of the work out of your hands. Sometimes Facebook doesn’t pick up changes right away. 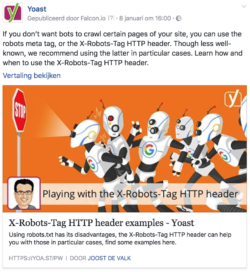 So if you want to “debug” how Facebook perceives your page, open up a URL in the Facebook Debugger, this one for instance is for the Yoast.com homepage. If you have video content, you would need to do more work, unless you’re using our Video SEO plugin. Our Video SEO will take care of all the needed meta data, and by doing so it will allow you to properly share your videos on Facebook. The author Twitter account, which he / she can enter on their individual WordPress profile page. Preview your social media post! Facebook profile URL, make sure follow is enabled on their profile. Pinterest’s Rich Pins allow for OpenGraph markup as well. To create a rich pin you should add variables like product name, availability, price and currency to your page. As this is mainly interesting for products, we decided to add functionalities to create rich pins to our WooCommerce plugin.